Current Commission-List: ALL SLOTS TAKEN, Thank you! *reserved slots usually get declined/reset after a month without written claim or payment, except for special agreements. If you would like to get a charcter drawn in a different style or type than described on the following two pricelists please ask me via NOTE for a detailed price information or a calculation example, Thank you! To CLAIM a COMMISSION please fill out THIS FORM! After I get the informations via the sent-in forms I will contact the commissioner to discuss further details and finalize the commission-order, depending on how much filled-out forms I get, I plan to choose three of these commissions for the beginning. If there will be much more, I will add more slots after the first three ones are finished. Trade with my part / their part? Prices are usually shown with current commission offers I make or will be estimated after I get a detailed description of the desired artwork and it's planed usage (personal or commercial usage). I only accept payments via Paypal through invoices. Payment can be either fully paid up front or after receiving the sketch-stage of the desired artwork. (on sketch commissions payment needs to be full up front, no exceptions there) Prices shown on my commission offers are only average prices which apply on most of the commissions I make, in special cases, for example when I have to make more changes as normally included, if the character is very detailed and has special features, etc. the price can rise within the commission progress. I normally don't offer refunds, in very special cases when I can't finish a commission due to personal or other reasons I will provide a refund coming from my side. I also reserve the right to cancel a commission due to poor communication, rude or inappropriate behavior by the client or if changes of the final artwork are required which I can't work out, time or type-wise. Add-ons, like adding features (wings, different clothing, more details, background, pets, etc.) are possible after the sketch-stage is finished but will come with extra costs, even if those features were initially included but not wanted by the commissioner at the beginning. The same applies for upgrading commissions, if you bought a line-art and want to upgrade it to a colored painting, this is usually possible if my time-frame allows it (depends on the type of commission) but also with extra costs of course. I don't offer exact timelines for my commissions, as it's hard for me to tell when I am going to finish what. I mostly work on commissions besides a full time job and various projects. It can happen that a commission I usually finish within a month can take up to three months to be finished, please keep that in mind. If you need an artwork to be finished on an exact date please tell me up front, I'll do my best but it can happen that I cancel a commission just because I won't be able to finish it in time. The client isn't allowed to sell prints or perform any other form of commercial usage of the artwork. The client is allowed to change the size, cutout and color of the artwork for personal usage (for icons, wallpapers, etc.) The client may also upload the artwork on their personal websites or galleries if those websites are for legal and non-commercial usage. (but in any cases please tell me before) credit is required in the form of a link back to the artist's original artwork or the gallery. I offer the option where the full rights of an artwork can be purchased. This means the client can use the artwork for any commercial-usage as long as it is for legal opportunities. (including selling prints, use the artwork logo-wise for a company, etc.) It is not allowed to alter my artwork and sell it multiple times as different artworks, even if the full rights are purchased. For more detailed information concerning the usage of commercial artworks from me, please contact me. If you plan to use a commissioned artwork commercially please tell me up front! Depending on the type of commission I normally only work with full descriptions and if reference images of the desired characters are given. If the commission isn't stated as a character-creation commission I won't design any characters from scratch. By ordering a commission from me, the client is agreeing to all the rules above. Bei digitalen Skizzen Commissionen wäre als Hintergrund nur etwas einfaches wie ein Himmel oder so möglich, das wäre im Preis inbegriffen. Thema würde mir auch zusagen! Kann ich dafür auf dich zurück kommen sobald es passt? Kann sein dass es dieses Jahr nichts mehr wird oder wenn ggf im Dezember. Aber das ist nicht ganz sicher. Noch ein schönes Wochenende ! Hi there again! Mind if grabbed a slot? Oh gosh i can't afford any of these anytime soon. ^.^ good luck with the comissions! I'd like to grab another coloured sketch piece from you, please. This time of Tseatah. Perhaps could discuss the details over note? I will take a colored sketch piece. 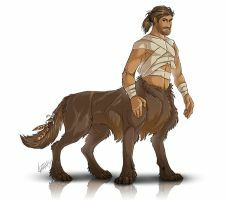 This time it can be my fox-centaur character, if that's ok with ya. If you prefer, we can discuss further details via note I will reserve the first slot for you. Oh surely! Looks like a great character to be drawn! Do I read that correct? Do you have a free sketch spot open? Is it like a "request"? Oooooooooooooh- X'D I'm so terribly sorry! May I take the Slot with her please? I'll gladly provide signal boost on tumblr. Ooh awesome! I might consider this! - can finish commissions within days! Commission OPENLate JANUARY Commission is OPEN! I only have 4 slots open for this month. Any character you want be it original ones or not. I do not do nsfw stuff. Any additional things like simple background, lightning, fire, etc, would cost extra too depending on how hard it is. I decided to combine chibi and halfbody together because I find that drawing these chibi drawings is just as much work as the halfbody ones. As usual, email me @ commission.pencilhead7@gmail.com to order and to give me description or references. Cheap commissions open! (NOT CURRENT)Hey guys! Decided to start doing commissions for the first time! A description of the character, their personality, details, etc. Whatever you feel is important to know ! Taking Commissions - Update Sheet 2018WHAT ARE MY SERVICES? I provide coloring or painting services to pre-existing linearts. Whether they are from another artist you commissioned them to do, or they are a lineart you found and you would like color/painted. I can also paint custom backgrounds if the originals do not contain a background - Please note that there will be an extra for such a requirement. Please do note, that each picture is different and while may prices will have a standard limit, they can possibly change based upon the actual image you're wanting colored/painted. As well, sketches or linearts can be commissioned as well. For "single" pieces in painting/realism style, (meaning no background, single character, not a portrait), it will be around $70. If there's a lot of detail more than most linearts, it would be around $75-80 but that bit can be negotiated.